Since we had to stay home for the weekend instead of going Gorilla trekking due to the house injuries, we made the most of our break. We had a wonderful sleep in this morning, before heading into town to meet one of Alex's friends, Patrick, at a famous coffee shop. Patrick is super artistic, and an incredible painter… Some of his pieces were even up in the coffee shop! Throughout the course of our meal, we were fascinated to hear about Patrick's many talents, and how humble he was as he spoke about them! We're hoping that we can visit him at one of his piano gigs this week, at one of the many hotels around town. After brunch, we walked around town, and Patrick showed us some local markets, where we picked up fresh fruits for the week. We got a kilo of passion fruits, to satisfy our craving since last week's exposure to the wonderful fruit. We also picked up two dozen mini bananas, and a giant pineapple. 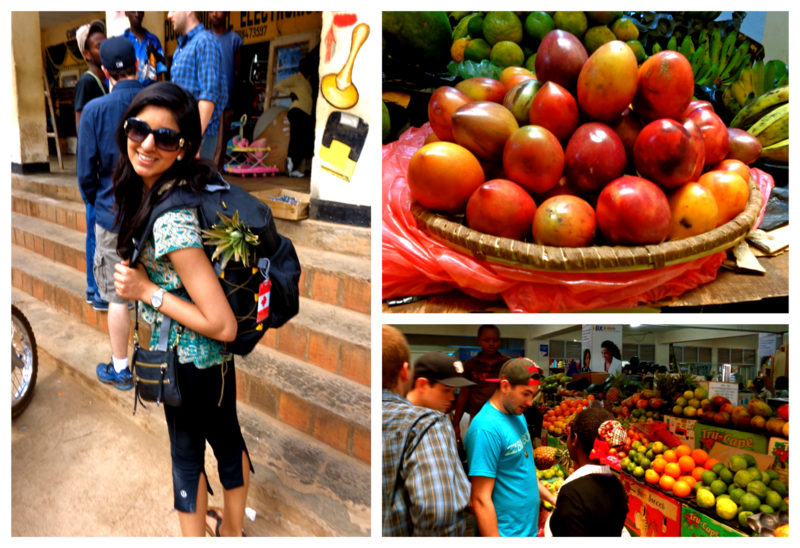 Of course since I was the only one with a backpack, I became the fruit lady for our walk about town. We also stopped by a local artisan market, and found some really neat trinkets and jewelry. I was super thrilled to get my shopping fix, and am excited to sport my new pieces in class next week! Patrick then took Alex to the outskirts of town to meet his family again, as they hadn't seen him in over a year, while we did some work at home. When they came back, Patrick surprised us with another hidden talent of his, as he treated Chris' ankle with some really great naturopathic medicinal treatments. The four boys then made their way to town to have a guys' night, and I got ready to go to meet my "Kigali family." One of my dad's closest friends from home had connected me with his son, Samir and daughter-in-law, Aleena, who are in Kigali for the week. Aleena was born and raised here, and they now live in Calgary. They are in town for Aleena's grandmother's 80th birthday, and I was so grateful for them to invite me, welcome me with open arms, and treat me like a member of the family. The birthday party was a grand affair, on the terrace of a beautiful mansion overlooking Kigali, and the food was absolutely delicious. I got a bit teary eyed when one of the grandkids made a speech and toast to his grandmother, as I started missing my late grandmother. He described attributes in his speech which are exactly how I remember my grandmother, including her sense of humour, her need to always be doing something, her endless energy, and her being the glue that holds the family together. It was definitely a special moment, and I know my grandmother was smiling down on me from above. After dinner, Samir and Aleena invited me back to the family home to play cards with them and some of Aleena's aunts, uncles and cousins. It was a lot of fun, and they were all so warm and welcoming - definitely made me feel at home! Overall, I definitely had some moments today that made our staying home for the weekend worth it, and I'm really glad we did!